Lorenzo Baldisseri, Titular Archbishop of Diocleziana, Secretary General of the Synod of Bishops. Gerhard Ludwig Műller, Archbishop-Bishop emeritus of Regensburg, Prefect of the Congregation for the Doctrine of the Faith. Beniamino Stella, Titular Archbishop of Midila, Prefect of the Congregation for the Clergy. Vincent Nichols, Archbishop of Westminster (Great Britain). Leopoldo José Brenes Solórzano, Archbishop of Managua (Nicaragua). Gérald Cyprien Lacroix, Archbishop of Québec (Canada). Jean-Pierre Kutwa, Archbishop of Abidjan (Ivory Coast). Orani João Tempesta, O.Cist., Archbishop of Rio de Janeiro (Brazil). Gualtiero Bassetti, Archbishop of Perugia-Città della Pieve (Italy). Mario Aurelio Poli, Archbishop of Buenos Aires (Argentina). 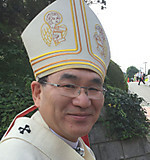 Andrew Yeom Soo jung, Archbishop of Seoul (Korea). Ricardo Ezzati Andrello, S.D.B., Archbishop of Santiago del Cile (Chile). Philippe Nakellentuba Ouédraogo, Archbishop of Ouagadougou (Burkina Faso). Orlando B. Quevedo, O.M.I., Archbishop of Cotabato (Philippines). Chibly Langlois, Bishop of Les Cayes (Haïti). Loris Francesco Capovilla, Titular Archbishop of Mesembria. Fernando Sebastián Aguilar, C.M.F., Archbishop emeritus of Pamplona. Kelvin Edward Felix, Archbishop emeritus of Castries.